Macson Cadet was born on January 25, 1990 in St. Maarten to the parents, Jocelyne Cadet and Melius “Albo” Feye. He cherished his mom very much. Macson attended Jones High School. He participated in AP classes, sports and received his high school diploma in 2009. 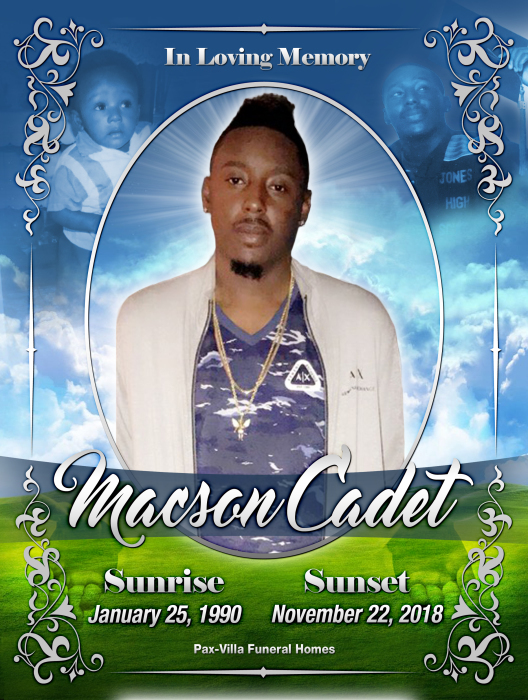 Macson enjoyed sports, playing basketball, watching sports and spending time with his family and friends. He left behind so many friends that loved him and he touched the hearts of so many. Macson was a very humble person. He was very special. He was an active father long before he had his own daughter, participating in sporting events and even being a football coach for his step-son and nephew, whom he loved very much. He not only loved his children, but those in his extended family. He valued his family. From the very beginning he was a very hard worker and provided for his family. Macson was employed at Amway Arena and Moonfish restaurant. He also worked construction and other maintenance jobs. He was joined in Holy Matrimony to Brianna Eady on February 17, 2018. He took on the father role to Joshua Eady and to this union, Madyson Cadet was born. He was the “greatest father” who worked very hard for that title. He was suddenly and tragically snatched from our lives and replaced with memories and tears. A tragedy for all those affected by this loss. Macson will forever be loved and missed. Alnatas, Kestia Ambroisse, Chiana Am, Brianna, Tamaya, Yolande and a host of other Nephews, Nieces, Aunts, Uncles,Cousins, and Friends. God called Macson Home on Thanksgiving morning and that is a reflection on what a giving person Max was in this life.